Let me teach the basic steps on how to build a website for your first online business? Hello buddies, thanks for the opportunity to write a post on one of the hot topic in the blogosphere, how to build a website in just a few simple steps or few minutes. Everyone is trying to build a website and to fulfill this destiny, they are always searching the Google for the best guide to teach them. But so far, everyone has explained their own way of building a website but, only a few articles out there which teaches the exact methods to proceed. In the current decade, if you have plans to start any business or having an idea for a product or a service, then the essential part is to have an own website. Creating a beautiful website is a tedious process, and have to follow lots of steps and pieces of information are needed to build your first website. Let me walk through the process of simple steps on creating a wonderful and beautiful website for your business or for your career. Before starting any business, ask yourself the purpose of the business. Only a few peoples were turned into a successful entrepreneur because they run behind their passion. I have asked many of my audiences, why you want to create a blog or a website? The most answer I got was, “to make money”. Of course, we need money to live, but the money is not the everything. Blogging is a chance to communicate with the world. It is a great way to share your thoughts, ideas, and tips to the world. It is your virtual home. I must express my thoughts here because, in my 2018 resolution, I vow to create 2018 successful entrepreneurs in the blogging field. To get started the individual should have his/her own blog and hosting, a very nice looking blog with a premium Word Press theme etc. All these three things will cost you because there is no such a good business without investment and moreover this is not an investment. Many people prefer to start with free blog hosting such as Google’s BlogSpot, WordPress sub-domain, and Weebly. There are many similar kinds of providers are available. The first important thing is that you won’t get a fully qualified domain name which you can’t rank ever. Free hosting providers will allocate very limited resources such as hard disk space for storage, minimal RAM, and bandwidth, which is not sufficient. Too much of restrictions in the theme customization and you can’t bring a high-quality layout. No guarantee your blog will never be suspended, as they are offering for free, they have the complete rights to suspend you sub-domain anytime. Imagine the situation, after a long day of hard work, you just started to earn revenue, and your blog was suspended. Also, they add advertisements and links without your consent which will annoy your users. If you go with the paid domain and hosting, all these restrictions have no effects on your domain. You have the full admin rights and control until the license ends. Ok, let me walk through the actual process to describe how to create a website today? 1.) Select the Right Niche. Well done, so you have decided to start a blog on your own. I must congratulate you for taking this firm decision today. But remember, it’s not enough to just have a website in these days if you ultimately wanted to make money online. Everyone is creating a website/blog, but maintaining the website requires a lot of damn efforts to drive a steady flow of visitors. Let me come to the point, the very first step for the question how to build a website was to select the right niche based on your passion and the Interest. Do not select a random niche just for making money. Imagine how could you come up with valuable content on your blog useful to your community without having interest. The most successful money making websites are niche specific websites only, where the blogger has sound knowledge around the subject. You do not have to start as an expert in the niche, but you should have the interest and the willingness to learn new things. Most profitable niches are Finance, Money Making, Career options, Investments, Students jobs, travel blog and Health-related niches. If you have any skill in any of these fields of interest to learn, then, of course, you can choose this niche to start. Once you have chosen the niche, then find the right domain name and register. It will be more powerful if your domain name has the niche keyword. Secondly, the domain name should reflect the subject matter as far as possible. It helps to build your brand and makes it easier for others to remember. Registering a domain is a very easy task and require only a very small capital fee up to $15 depending on the registrar you choose. The most recommended domain registrars are Godaddy, Namecheap, Bluehost, and Hostgator. They are the top domain name sellers across the world. If you are looking for any personal assistance in the domain registration, reach me here. Choose a domain name that is easily memorable and remember-able by all people. Once you decided the niche, find the right domain name with keywords. Registration will hardly cost you less than $15 only for one year. It is very important because the domain name is your online identity. You can register the domain names with Godaddy, Namecheap, BlueHost, HostGator and with me. Next, to the domain name selection and registration, hosting is very important because from here only your website/blog will be served across the world. Web Hosting service is a special server located at some physical location called as a data center, where you host your web pages, files, images and other digital documents. Your website should be accessible anytime from anywhere in the world. 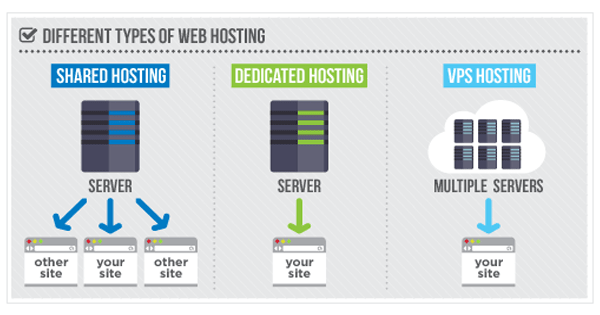 There are three different types of hosting services are there in the market and we will see here. 3.1.) Shared Hosting: Here, you host your website in a shared environment, which means a single server share its resources across many blog/websites. It costs you normally between $10 – $20 a year. Suitable for beginners and you can upgrade your server once your business grows. I will not recommend this because your site quality will be compromised by other sites hosted in the same shared environment. 3.2.) Virtual Private Server: This is slightly different from shared hosting environment. But here you will get the guaranteed resources for the monthly recurring payments. In VPS, each virtual server will act as own dedicated server from one big physical server. Here the resources are isolated to each account. This hosting is bit costlier and has to pay every month between $20 – $50. If you think your business seriously, then I recommend you purchase VPS hosting. 3.3.) Cloud Hosting: Cloud-based web hosting refers to a new technology that lets several hundred websites to run together in a single giant server. It has many advantages such as the server itself increases its resource limit based on the increase in traffic to the blog. Here, you will pay for what you use. 3.4.) Dedicated Server: Which means, you are renting one complete physical server from the data center to host your blog. You will have full root control access and all the resources are completely dedicated to serving your blog/website. This server is much costlier that costs you around $100+ every month based on the size of the server. So, choose the server wisely based on your budget and monthly expenses. To those who wish to start blogging business seriously, I recommend going with VPS or CLOUD hosting. Initially, I suggest you purchased a shared hosting server and when your site traffic starts growing, upgrade your server. It will not cost you more than $20 per year. Recommend Hosting providers: Bluehost, Godaddy, NameCheap and Myself. Creating a website or a blog won’t happen overnight and it takes time and concentration to create the best-structured layout. When I started blogging back in 2013, Content Management System such as Word Press was not flourished at that time. I created this blog, Online Home Income, by using basic HTML table design method and later upgraded to Word Press. But in 2018, creating a blog/website is very easier with just a few mouse clicks with the introduction of WordPress Content Management System. You can build your website in few minutes but the actual part is choosing the right theme to fit your business. There are many free themes available on the market, but I will not recommend going with the free theme because of lots of limitations. I personally recommend Thrive Themes, Genesis Themes to purchase for your blogging business. They are the top selling brands of Word Press themes. After you installed your theme, you should have the following plugins to support your blog growth and development. Yoast SEO Plugin: This is the most common SEO plugin power more than millions of WordPress domains. W3 Total Cache: This plugin is used to build up an HTML content to serve your web pages faster. Akismet: The internet is full of spam everywhere and to stop comment spamming you should employ this plugin. Contact Form 7: Communication is the major influencing factor of the blogging success, you should let your blog visitors communicate with you easily. These plugins are very important for every Word Press but additionally, there are thousands of plugins you can use later. 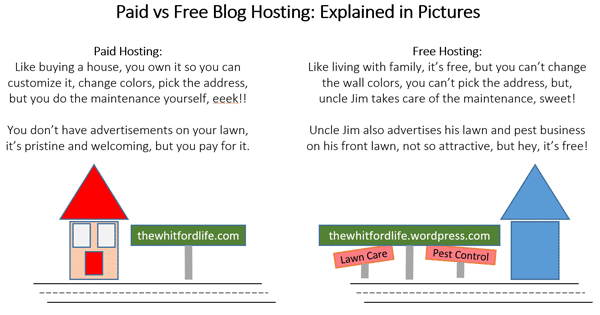 Do not start your blogging with free WordPress themes. The main reason is you won’t get Adsense Approval. Free themes are not good for SEO and hence I wish you to go with paid themes such as Thrive Themes, Genesis Themes etc. Normally, with $60 you can purchase a premium theme. You can visit our online home income store to purchase themes. So far you have learned the process of how to build a website? Now we will see the action part of this business which is writing contents, publishing and promoting. From here is the actual part of your business starts. Now, you have to sit and perform Google search to build the list of top performers in your niche. Then, doing keyword research is the next step. Many people usually stuck here in this process, because they don’t know what to write and how to write? Everyone has their own writing style and skills to produce a useful content. So there is no big deal here, and remember to write for your audience/readers and not you. If people needed to visit your blog/website often, you should produce more quality content at the regular interval. PS: If you are looking for any kind of content writing jobs from home, then I have listed some genuine paying website on my blog. Once you completed the blog setup process, now you have to write contents to publish. There are many online tools available to support you write articles. They are Grammarly, Evernote etc. Visit our online store to purchase the necessary kits. Once you published your first post on your blog, create a sitemap and submit it to Google search engine. It’s not necessary as all the web contents on the internet are index-able by Google and submitting sitemap is just to speed up the process. Then, leverage various social media such as Facebook, Twitter, Google Plus and post your content to put in front of the millions of eyes. 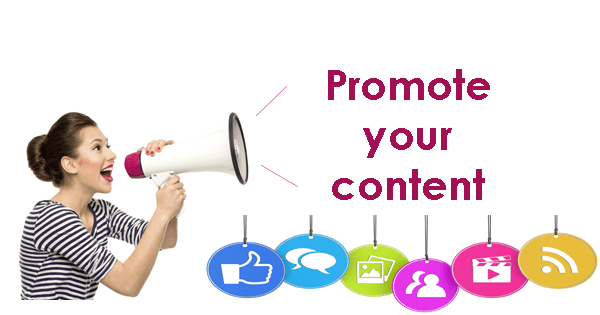 Every time when you publish a new post on your blog, promote it to all the social media platforms. This method helps you to drive instant traffic to your blog and at the same time, you should perform various OFF PAGE SEO activities. Perform various link building activities such as Guest Post Publishing, Link Exchange, Forum Participation, Article Directory Submission etc. These are the very important activities to drive traffic to your blog and increase your brand value. 1.) Post on Social media sites and establish new connections. 2.) Grow your social media followers. 3.) Write for other blogs (at least 5 blogs every month). 4.) Be active in forum sites related to your niche. 5.) Collect your visitor’s emails and build a mega list of subscribers. All these tips will be useful for your the first time and if you want to grow your audience and make them come back later, you should produce more new quality contents. Many bloggers are doing this major mistake that they are not often consistent in producing new contents to their visitors. Search engines and the people like to read the new and fresh information available on the Internet. So, if you want to rank high or to drive more traffic, publish new contents often. This method of advertising is a kind of displaying ads relevant to the page’s content or the browser history. An automated targeting system to display ads for higher conversion. One of the popular examples is Google Adsense, where Google automatically serve ads on your blog and pay you a percentage of profit they make. Normally an Adsense publisher will earn 68% of revenue every day and they will pay you every month once you reached the minimum of $100 payout threshold. There are so many kinds of online jobs on the internet that can be done from home, but out of them, this method works very well. I have written a very descriptive article on Adsense method of generating revenue linked here. This works very similar to Google Adsense. These networks display advertisements on websites or apps through various ad formats such as images, text, flash, gifs, audio, and video. The main purpose of this advertising is to deliver general advertisements and brand information to the site visitors. This method is also profitable if you have a blog with at least 5K visitors every day to generate some decent revenue every month. Most Google alternatives such as Propeller ads, Native ads, Chitika has display advertisement options where you can display some random ads to earn money. This is a kind of performance-based business model where an individual called as an affiliate who earns commission on every successful sale. This business is the most lucrative and profitable business ideas as one can easily make huge money by selling someone else (merchant) product or services. There is no need to have your own product/service to sell on the market. Simple find any trust-able high paying affiliate programs and enroll yourself for free. I recommend Amazon Affiliate Program especially for you because where I am making such a decent volume of income every month. How to start this monetization process? First, register an affiliate account with this program and wait for your approval. After approval, find the hot selling product and also suitable for your blogging niche. Each product has its own unique affiliate tracking URL with Banner or text link ads, just copy the code and paste it into your blog. Refer visitors to click on the link and once they successfully placed an order, you will earn up to 12% commission from the Amazon. This is another way to monetize your blog if you have many loyal audiences to convert into your buyers. You can sell your own handmade products especially for housewives, this method is much suitable to them. This is just an example for you to get an idea so that you can come to know, how to create a website to make money by selling products and services. Google Adsense and other display networks have a state-of-the-art software to display advertisements on your blog. Like the same, if you have at least 5000 visitors a day, you can invite advertisers directly to advertise on your blog. Create a page named as, “Advertise with us” and disclose your Google Analytics traffic report, Alexa ranking, Social strength. Quote the best price you can offer for the advertisers. This removes the mediators and you will get your payments directly to your account at the end of every month. Dear buddies, once again thank you a lot for your patience to read this complete article and I hope I have delivered the best I can do. 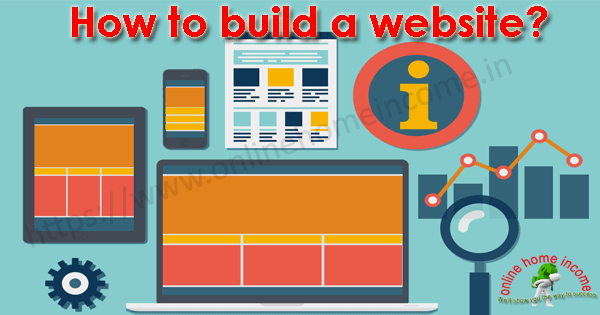 I have written all the basic steps to be followed to build a website. Good Luck and All the best for your new venture. Let’s put an end to your hesitation and start with the determination with new aim and goals. There are many successful bloggers out there where you can see in this real world, all of them started their career exactly as I written here. Now, they have grown up to the highest level. Hard work never let anyone down. Hey wait don’t go, have you decided to start a blog or not. If yes, visit here. Still having doubts, please ask me in this page comment section as I want you to take a firm decision today itself.